Samsung recently unveiled its first foldable smartphone - the Galaxy Fold. This smartphone carries a price tag of $1,980 making it a luxury item. Well, if you are spending that much money on a smartphone, you might also want to spend a bit more and get a protective case to prevent any damage to it. 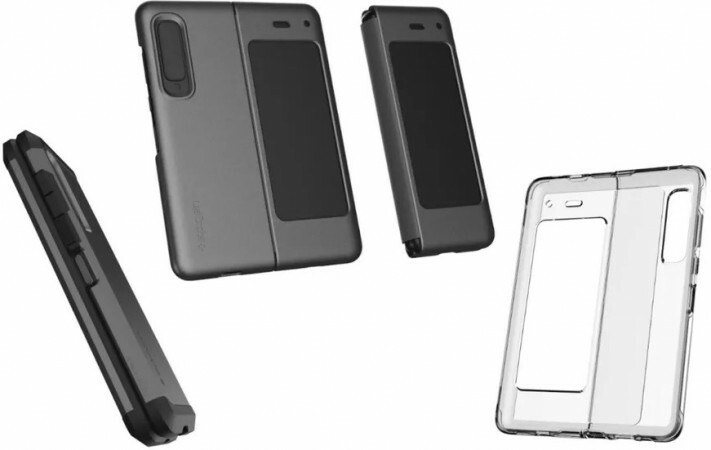 Popular case maker Spigen has shared renders of its protective cases for the Galaxy Fold giving us a glimpse into the foldable future. Spigen's cases for Galaxy Fold will come in three models - Tough Armor, Thin Fit, and Ultra Hybrid. These cases will be made out of silicone and plastic materials, and will cost around $20. That's not a lot of money if you have already spent almost $2,000 on a smartphone. These cases will have similar designs and will protect the bezels around the 4.6-inch display that sits on the outer cover. Needless to say, the cases will also have cut-outs for microphone, buttons, cameras, and ports. However, what's interesting to see is how these cases will cover the phone as it relies on a hinging mechanism to fold and unfold. Moreover, the material used should not only be strong but should also be flexible enough - for obvious reasons. The Galaxy Fold will be available for purchase sometime in Q2 2019, so we will see these cases go on sale around the same time period. Nothing like addressing extra thickness to a brick already.. I will need to buy trousers 3 sizes bigger so I have big enough pockets to fit it in..